This Prize Wheel Pens are Perfect For Write-On Gaming Boards. 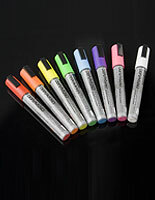 Buy Florescent Marker To Brighten Up Your Spinning Game. These Prize Wheel Tools Ship Same Day (Mon-Fri), When In Stock! High Quality, we shopped around the world to find these! 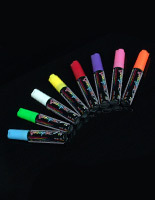 This fluorescent marker, bright stick produces a brilliant neon colored message on your advertising boards. 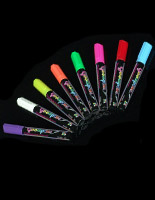 We had this liquid pen specially made per our specifications best service customers. This fluorescent marker features not too easy smudging after applied (so customers don't wipe off) but can easily be erased with a wet cloth. The unit also does not leave long lasting residue (ghosting) on your board. 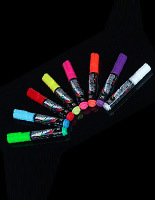 In addition, this fluorescent marker, also known as liquid chalk has a perfect fluidity producing even flow, and vibrant neon coloration. 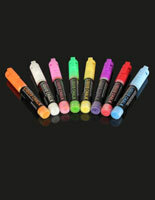 We think this florescent chalk package (six colors) is the best we have ever seen having received samples worldwide. 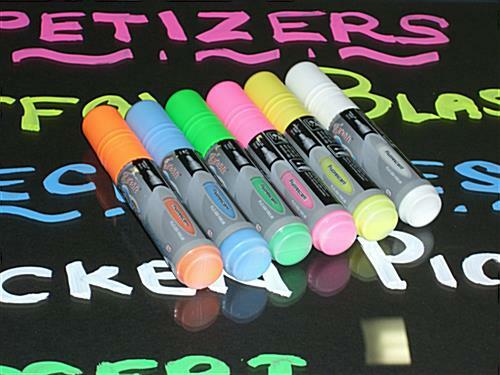 This menu chalk, or fluorescent marker is great for frequent message changes and daily special advertisements! 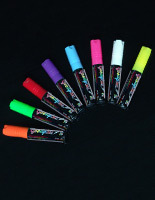 This neon or liquid pen is commonly found and used on flashing boards seen in; night clubs, movie theaters, restaurants, and retail environments. This fluorescent marker is useable on any non-porous smooth surface like windows, glasses, metals, acrylics, and other hard plastics. 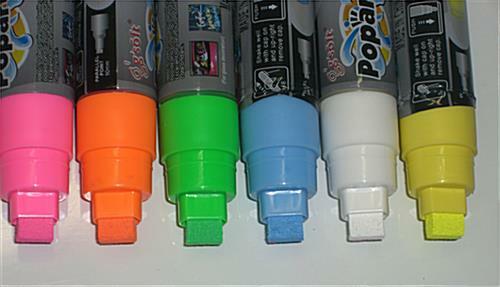 These neon markers work incredibly well on an edgelit write-on board! 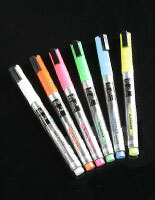 The bright fluorescent marker colors are accentuated by the LED lighting. 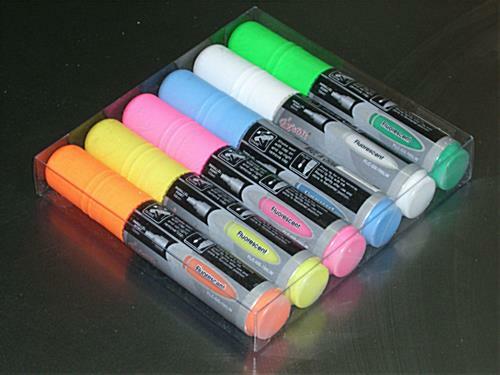 There are 6 markers in each package with different neon colors (white, yellow, green, blue, pink, orange) for you to be creative in designing your display board. 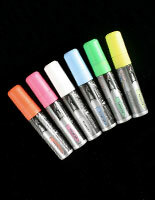 Price is for set of 6 fluorescent markers.